At Uber Eats, we are always looking for new ways to offer our customers the widest selection of food and beverages from top restaurants. It will not surprise all the coffee-lovers out there that it’s one of our most-searched drinks, with orders increasing by more than 255% over the last year. That’s why we’re so excited to announce that we are expanding our Miami pilot with Starbucks® to bring more Eats customers the food and drink they love. Beginning today, we are live in San Francisco, and over the next few weeks will launch in New York City, Washington, DC, Boston, Chicago, and Los Angeles. Yes – that means that whether it’s a Caramel Macchiato or Iced Blonde Americano, you’ll be able to enjoy it wherever you want. 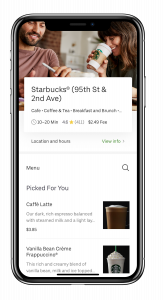 Download the Uber Eats app on iOS and Android to find your nearest Starbucks. Delivery is subject to availability in your location so check out the Uber Eats app for more details.